We run down the essential new tools for digital illustrators. This month we're taking a look at what you need to get started with digital illustration. For those artists who are already set up, this is your chance to see if you're missing out on something epic. In this buying guide we've got tools aimed at studio recluses (if you're going to hide out and get creative in your own space, that space had better have useful tools), as well as tools for digital artists on the go (or those who have a small studio space) and a bonus tool that's good for everyone. The Cintiq 22HD touch is an incredible device that makes for a great entry-level pen display. While you can start with the smaller Cintiq 13HD model, it's likely you'll outgrow that graphics tablet sooner rather than later. Alternatively, and if you can afford it, the Cintiq 27QHD is really the best way to go. Check out our Wacom tablet deals post for the latest deals, and our best drawing tablet guide for a comprehensive roundup of different models. Another great choice for the studio is the Wacom Intuos Pro Paper Edition. What we like about this pen tablet is that you have the ability to use the drawing paper of your choice. In doing so, there's a lesser chance of losing that hand-eye connection that is so often lacking when using pen tablets. Clip Studio Paint is my software of choice for digital art and illustration. Although you can add custom tools to your setup, the standard pencils, pens and brushes bring the feel of traditional drawing to the digital space. In short: very few tools feel as natural as this one. If you need help in getting started, check out this round-up of Clip Studio Paint tutorials. If you're looking to stay up-to-date on the latest digital art trends, check out our own ImagineFX magazine. Available in print and digital formats, ImagineFX is the world's best-selling magazine for digital artists. With a one-year subscription, you'll receive 13 issues packed with interviews, news, product reviews, workshops, and galleries. There are some mega discounts available right now too – save up to 47% on a subscription for you or a friend for Christmas if you act quickly. Although I still haven't had an opportunity to play with one of these myself, several of my colleagues have – and the response has been overwhelmingly positive. A word of caution, though: if you do plan on getting one of these, you'll need to shell out. Choose between the 13-inch model (Intel Core i5, 64GB) and the 16-inch version (Intel Core i7, 512GB). Which one should you get? Simple! The best you can afford, in the size you want. Again, there are some great offers on both in the Wacom tablet deals post. Not looking to drop that much money on a mobile studio? No worries! A great, and slightly cheaper alternative, is the combination Apple iPad Pro and Apple Pencil. To find out what we thought, take a look at our review – we gave it five stars, and were especially impressed with the new dock. A personal tip is to pick up a couple of Apple Pencils (when you can afford it), so you're never without a fully-charged one. Quite possibly my favourite item on this list is the newly released Clip Studio Paint EX for iOS devices. That's right, Clip Studio is now available on the iPad! What's nice about this is how seamlessly you can move from your iPad to your desktop – that is, if you even want to do that, because the iOS version is 100 per cent complete, without limitation. Another excellent tool for the iPad is Procreate. Many artists I know swear by this tool. Will Terry of Society of Visual Storytelling (SVS) has this to say about it: "Procreate on the iPad Pro has enabled me to take my studio anywhere on this planet. I can go from thumbnail to finished drawing – and/or finished art – without needing to visit the art store, or without the aid of a light table or printer. 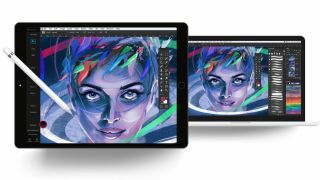 "The iPad Pro is light years ahead of the first version of the iPad, and with Procreate, it's a fully-fledged professional tool for professional artists. I created all of the finished art on the iPad for my last children's picture book. If something happened to my iPad, I'd order another one today." No list of digital illustration tools would be complete without the industry-standard Adobe Creative Cloud. With Creative Cloud, you'll have access to some of the best tools available on both desktop and mobile platforms – read our review of the whole Creative Cloud suite here. At a minimum, you should sign up for the Single App plan and choose Photoshop. Alternatively, and definitely a better deal, consider signing up for All Apps instead. With this plan, you'll have access to the entire Adobe Suite of tools, including Photoshop, Illustrator, InDesign, and loads more. Last, and certainly not least, is Astropad. Astropad lets you turn your iPad into a graphics tablet for your Mac, and it's available in two versions: Astropad Standard ($29.99/one-time) and Astropad Studio ($79.99/yr). Which version you choose depends largely on how you plan to use it. To help you decide, find out the difference between Astropad Standard and Astropad Studio in this blog post.